Sometimes, the biggest winners of TV talent shows aren’t even the actual winners; Susan Boyle gained worldwide notoriety even though she lost that year’s Britain’s Got Talent to dance group Diversity, and One Direction’s career skyrocketed following their time on The X Factor while nobody even remembers who won that particular series. Then, there’s Jessie Buckley; the Irish native was previously a contestant on 2008’s I’d Do Anything, a televised search for the role of Nancy in an upcoming West End production of Oliver!, and she did well enough to get down to the final two. Although she eventually lost out to Jodie Prenger in the end, her singing and acting career would soon start to outpace even Prenger, including a number of stage appearances and roles on notable TV series including Taboo with Tom Hardy and the BBC’s dramatization of War & Peace, before becoming an even bigger rising star thanks to her turn in last year’s psychological thriller Beast, for which she won a few awards including the British Independent Film Awards’ Most Promising Newcomer prize, and was nominated for several others including the EE BAFTA Rising Star Award. So far, so good for a former TV talent show contestant, but I suspect her star will rise even higher when people see her show-stopping lead role in Wild Rose, a funny, heartwarming and beautifully grounded crowd-pleaser that will put a spring in your step. Buckley plays Rose-Lynn, a young Glaswegian lady who’s just been released from prison, and makes her way to her mother’s (Julie Walters) house where she’s been looking after Lily-Rose’s two young children. Despite her mother’s stern insistence that she prioritise her children over anything, she continues to dream of escaping her mundane life in Glasgow and flying to Nashville to become a successful country singer. She soon strikes up a connection with Susannah (Sophie Okonedo), the upper-middle class mother who hires Rose-Lynn as a cleaner, and who nudges her in the right direction for her aspiring career to take off – but the responsibilities of being a parent start to become more apparent, and soon she is caught in a choice to achieve her dream or settle down and finally start acting like a proper mother. The movie is a perky, fun and sweet showcase for Buckley, who really is the heart and soul of the entire thing. She is such a sparky ball of energy in every single scene she’s in, playing a character who’s as wild as the title suggests but also extremely vulnerable when her harsh reality threatens to come crumbling down on her. She has the capacity to be funny, charismatic, and tear-jerking – sometimes all in the same scene – not to mention the uncanny ability to adapt her fantastic singing voice around a collection of bouncy country ballads. It’s in these scenes where Buckley is having the absolute best time of her life, and she expresses it in a very physical and passionate performance that is simply delightful to watch, especially whenever her character is singing on a stage and clearly in her element. Watch out, as well, for a wonderful supporting role from Julie Walters whose fiery character carefully treads a line between concerned mother and grandmother, and joyless shrill who wants her childish daughter to grow up and conform, never once becoming the villain but more so a sympathetic character who’s not without her own personality flaws. Buckley, however, is the film’s shining star, and luckily it’s also an instance where the film is about as enjoyable as its lead is. Director Tom Harper and writer Nicole Taylor know exactly what path they want to take their film in, and they do a good job of balancing tone and emotion whenever it shifts focus from Rose-Lynn’s country music ambitions to her more grounded ambitions of looking after her two young children, who seem to want very little to do with her after being locked away for so long. Harper lets his scenes play out naturally whilst giving his actors free reign to make their dialogue flow smoothly and like how anyone in reality would talk to one another – similar to how A Star Is Born, another recent country-music themed story, managed to achieve this – and Taylor, making her feature debut after her acclaimed BBC miniseries Three Girls, is able to give her characters enough range and three-dimensional personalities to ensure they’re people you want to invest yourself in, and root for their dreams to hopefully come true by the movie’s end. While it has themes of family and following your dreams, its overall message is one of conformity, but not in the gloomy sense that you may be thinking. One thing I really appreciated about this movie is how it recognises the importance of both things, and that for this character you simply can’t have one or the other; it would have been a rather sour ending had the movie concluded with either one of her choices prevailing over the alternative, because you recognise how important both of those things are to her as you follow her journey throughout the course of the movie, and to take even one away from the equation would take a massive toll on her infectious energy and sense of joy. The way that it does end makes complete sense when you take into account everything she’s been through, and you’re left smiling and even a little tearful at the wondrous endpoint for this sweet and respectful little musical journey. If nothing else, it’s proof that Jessie Buckley is destined for great things, even if she never got to be Nancy. 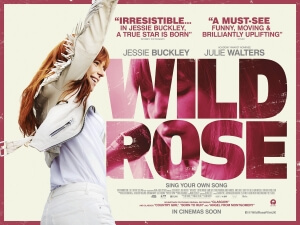 Wild Rose is a fun, enjoyable and respectfully grounded musical drama that works best as an acting showcase for Jessie Buckley, who is sensational in a lead role that is bound to gain her even more attention. A star is truly born.